I have not had time to write any scoop loops in the last couple weeks, but I have thrown a few with my rope. When I fly I use that time to write and sometimes in motel room in evenings. I like having that time so I enjoy flying and motel rooms. I share some observations from the last couple weeks. Judged the Zoetis feedlot challenge for about the fifth time. The skill level is so much better now than it was when I judged the first one. Many of the same people, just improved skills. When the culture changes, the outcome changes. My judging was the pen riding portion. The skills they used to get two numbered animals out was very precise, but with the correct pressure. The real good ones still had a large percentage of the pen laying down when they got the ones they needed out the gate. I had a hard time judging, ended up with lots of teams tied, so time became the winning factor. If the score was tied it went back to who got the job done fastest. I judged on safety, calmness of pen, calmness of pull, teamwork, and stockmanship skills. I got home from Lethbridge, and the next day headed to Fort Collins Co, and discussed going to work for a large operation. I would like to be a part of really managing resources and creating a good environment for a livestock operation. We decided not to pursue the job, but it would have been a nice challenge. It is a good outfit that does lots of good for the industry. I’m not so sure I’m not making a mistake. Next we went over the mountain for my yearly endeavor into the world of western luxury. I’ve been going to the “Home Ranch” for many years and have seen many changes. Each Manager has added to what the ranch has offered in their own style and I have learned from each of them. 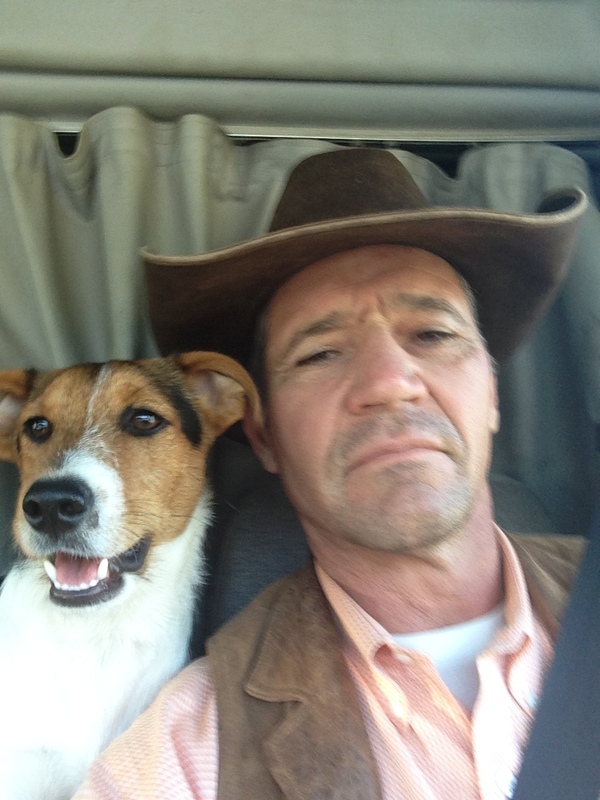 A big part of a guest ranch is the head wrangler, and they have had many different styles in the years I have been going. Michael Moon is the current head wrangler and I think he is very good at his job. He’s a cowboy that is good with people. The guests always fascinate me. They are willing to pay a lot of money(a lot of money) to live the life for one week that ranch folks live every day. Food and meals served cookhouse style (five chefs, not cooks) and all the outdoor activities we in the livestock business take for granted. My job was to present horsemanship and cattlehandling. Most of the folks only do it for pure entertainment, but are fascinated by the relationship humans and animals can have. We worked cattle, I started a colt, and just shared what we in the animal world do every day. Great staff, great guests, great cabin, great food makes for a great week. I’m glad I get to go back next year. Got home Saturday and left Sunday morning with daughter Mesa and we went to a benefit ranch roping for an old friend Maggie (Magpie)Beck, at the Wallace outfit in Hall, Montana. I haven’t been to a ranch roping competition in lots of years, and had a blast. Wife Tammy let me borrow her horse, who according to her is the smartest horse in the world, so I nicknamed him Spencer, after my cousin who my grandmother thinks is the smartest kid in the world. I had never ridden him before and he worked real nice. I really enjoyed watching Mesa rope and interact. The first round she was pretty timid and didn’t rope as good as she does. The second time she did much better. Comparing this competition with the feedlot competition was real interesting. This ranch roping was four team members roping four yearling, laying them down and paint branding them. The fastest time wins. It was real fun, and I understand it, but at the end of the competition the cattle were not as good as when we started. They weighed less and were worse to handle. At the feedlot challenge they were just the opposite. I’m not criticizing the competition. I would go to more of them if I could, because I enjoy the skills of “extreme” cowboying, and feel they are needed in the real world, and the competition showcases that part of stockmanship. The better you are at roping, setting up a good shot to catch, and working on the ground, the safer and less stressful it is. What these different competition show is the different pressures we put on with our handling and the outcomes of it. I was also surprised at the skill levels. Ranch roping have been going on for a long time and the skills have not improved near as much as I’ve seen the cattlehandling skills at the Feedlot competition improve. We loaded up and headed west to Ronan Montana, then went to Victor Montana the next day and finished up in Gold Creek on Wednesday presenting stockmanship and stewardship for NRCS. Three very different operations, managing resources to improve quality of life for all things. You want hospitality, go to western Montana ranches! The three operations were different, but the common denominator of all is how good the NRCS folks were, and how dedicated to the industry the three hosts were. Now let’s look at the producers in attendance. Mesa was amazed at how different each crowd was. The towns were not 100 miles apart, but the style of each was very different. That is what is so great about my job is observing how traditions, climate, terrain, and demographics create its own culture in each area. At Gold Creek, I new a lot of the producers and how their operations worked. I was raised just over the mountain so I was kind of at home. That made me a little nervous. I knew how good of producers were there and what they did on the ranches they manage. To be real honest, I like the animal work the best in my job. I had a guy at the Home Ranch tell me he thought I was more comfortable with the horses than I was in the dining room. He was right. I remember when I first came to the Home Ranch I would almost get sick, having to go and have dinner with a bunch of folks that new which fork to use first. I have over come it and actually enjoy it now, even though I still have silverware left over when I’m done. When I get to do a presentation where I know the people, I am just so proud to be a part of this business. Livestock people are good people. The people at the Home Ranch are good people. The lifestyle brings out the good in people. The best part of the last week was Mesa. She is a good hand. She has been working with some of the snortiest, most dangerous cattle in the world, but she has so much feel for putting the right pressure on. She really makes nice horses. She also is a good people person. We really had fun and worked well as a team. I hope she wants to do more. Every where we went someone wanted to buy one of her horses. The Thomas Hereford ranch hosted in Gold Creek. Someone wanted to buy Mesas big bay horse we call “Low Tone”. She said everything was for sale. After some fun discussion Mesa said that he was “for sale, but not on sale”. Everyone got a big kick out of that. So now I am on a plane to Denver and will be in Fort Collins for the next couple days for the big Stockmanship and Stewardship event with NCBA. I won’t get home for three weeks and will be going to New Mexico, California, Oklahoma, British Columbia and Alberta. I should finds something fun to talk about. This entry was posted in Uncategorized on September 22, 2017 by curtpate. Funny, what’s normal changes every 20 miles. Great article, with all that travel time coming up we’ll expect an active ‘scoop loop ‘. Thank you, Mr. Pate. I am honored to be part of your “community”. I’m on the diligent hunt for my Home Ranch where I can continue my lifelong learning of Low Stress Livestock Handling/The Vaquero Way. Thanks Curt. Great to visit with you at the Stockmanship and Stewardship event in Fort Collins. Safe travels to you. Home Ranch dinners always made me sick to my stomach too. Bleh.